I was taken to islands from earliest childhood; I evidently learned to walk on one of Iona’s beaches. I grew up in a writing family: my mother was a social historian and my father a journalist — he wrote monthly articles that were often concerned with remote corners of Scotland and the people who lived there. By the time I was fourteen I had visited most of the Inner and Outer Hebridean islands, but it wasn’t just that — I had had the privilege of sitting in remote croft houses to hear extraordinary stories of the second sight, of strange lights appearing and disappearing on moorlands, of other mystical things that fired my imagination with my own first writings. About the time I was fourteen I went with a school friend to camp on Coll and Tiree. The holiday was in truth something of a disaster: the weather was pretty ghastly, we hadn’t enough food, and my friend put his foot through the tent … that belonged to his mother. Back we came to Perthshire, rather miserable and not all that popular. But to this day I can remember pulling out the atlas in my father’s study to show my parents where we had stayed on the Isle of Coll. Here was an island my father didn’t know, and I was excited that finally I had found somewhere beyond his ken. I nagged and nagged until they agreed that we’d visit Coll the following summer. It was as though I had made the island myself. I was so excited, taking them to a new landfall, and I wanted it to be magical and breath-taking, exactly as I had found it. The little miracle was that that was precisely how they experienced it, not least because every new day there seemed more beautiful than the one that had preceded it. We stayed in a little wooden cottage called Stronvar over on the island’s west side, close to the castles, and within a stone’s throw of a beach. That place and that summer have somehow entered a place of myth for me. It is one of the times in my life I think of as being out of time, as though a doorway was entered from the ordinary and the everyday into a realm where what happens seems experienced on a different level. Perhaps these times, these moments, are what Neil Gunn described as atoms of delight. There are a scattering of them through our lives, to be guarded and cherished for ever. The truth is that I have written so often about that summer on Coll that I find it impossible to separate the stories I’ve created from the reality of the memories. The stories are extensions of the real days. I am fascinated by the truth of the fact that after years our memories of a place and time become akin to stories, and often there is little or nothing (except perhaps for faded pictures) to prove they happened at all. If we had to defend them in some Kafka-esque court — prove to a jury they had been real — we might have little but stories with which to do so. The stories have become part of the very fabric of our being. I have said that it was a wooden house. Of course in memory it is far bigger than it must really have been. I remember going everywhere in bare feet; I remember sand on the floorboards of each room. I remember my bedroom and the first night I was there: the sheer joy of knowing this had happened, and that all these days lay ahead of us. It was June and the sun seemed hardly to vanish from the sky: the nights were blue-grey and never dark, and the moon rolled up from the sea, full and eerie. I would get up and go out long before dawn every morning, and no-one worried for my safety. The greatest danger was from barbed wire. I wandered and wandered, searched beaches, hoped for otters, and came back for breakfast at last, blown out and with all manner of garbled stories. The morning I describe in the poem did happen exactly as I describe it. I have gone back to Coll to work out exactly the way I must have gone and where it all took place. I’m almost forty years different, but the place is not. The cottage and the castles are there, and the miles of open machair, and the beaches. It felt good, returning and almost forensically proving that everything had happened as I remembered. That it had been true. That time that was out of time. 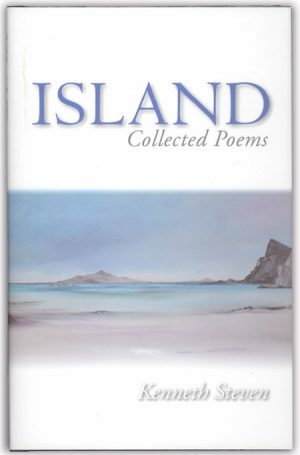 Kenneth Steven‘s volume of selected poems from Saint Andrew Press is entitled Island. His best-known volume of work, also published by the Press, is Iona. Poems inspired by the Hebrides, and especially by Iona, are to be found in further collections like Coracle from SPCK. They have also published his novel, The Well of the North Wind, set on Iona during the high days of the Celts and the creation of the Book of Kells.